There is nothing worse than wearing a product that wipes off in the rain. That's why we love, love, love waterproof makeup, and that is why we're letting you know these absolute must have items that you absolutely need to keep a fresh face all day, not matter what! From your face to your lips to the obvious, your eyes, these products are the ideal waterproof items you'll want in your bag at all times. The most known waterproof product is mascara, so let's start with that. Sound good, it is, just like this Yves Saint Laurent Everlong lengthening waterproof mascara. It can be described as a revolutionary mascara with a modern designed brush, this will give an instant and long lasting lengthening effect while keeping your lashes waterproof! Something you may not be keen on is a waterproof or long lasting powder. Christian Dior's Dior Skin forever compact leaves your face flawless and moist, a makeup inspired by nano-technology. It's waterproof(which is so awesome) and it's long wearing. You'll want to have this compact with you at all times, anywhere you go! A lip stain that lasts? They're supposed to be never do, but this Laura Mercier does, it's true! This hybrid of a stain and gloss formula offers the confort and sheen of a gloss but is long wearing. With quick application and a clear glass pot packaging, this is an essential for the summer and can easily be put on with a lib brush or even your finger tips! 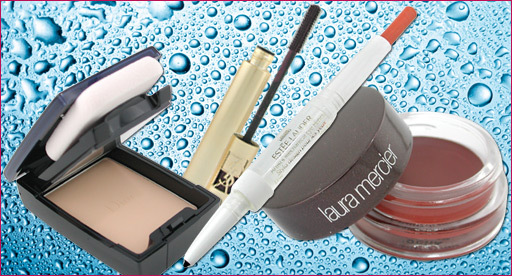 What waterproof, longlasting product can't you live without?